Generosity comes in many forms. We can give generously of time, love, compassion, labor, wisdom, and of course, money. Giving generously requires us to give beyond what comes easily. We are called to give until we know what we are giving is a gift that is good. 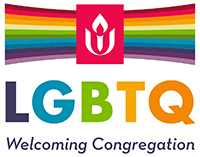 We have celebrated a great bounty of giving here at First Unitarian and yet there is an ongoing invitation to live more deeply into our shared generosity, keeping the work of our congregation going. This Sunday will kick off the pledge drive for our next church year and we will feel the goodness of our generosity.